Individuals earning nearly $46,000 a year and families of four earning $94,000 may be eligible for federal tax credits under the new health care law. Tax credits are the mechanism by which the federal government caps how much people pay for health insurance premiums, which are set by the private market. The premium caps are based on how much someone earns, relative to the federal government’s definition of poverty. Here’s an example of how premiums are calculated for, say, young, single workers who earn between $17,236 and $22,980 per year, which is between one-and-one-half and two times the poverty level. 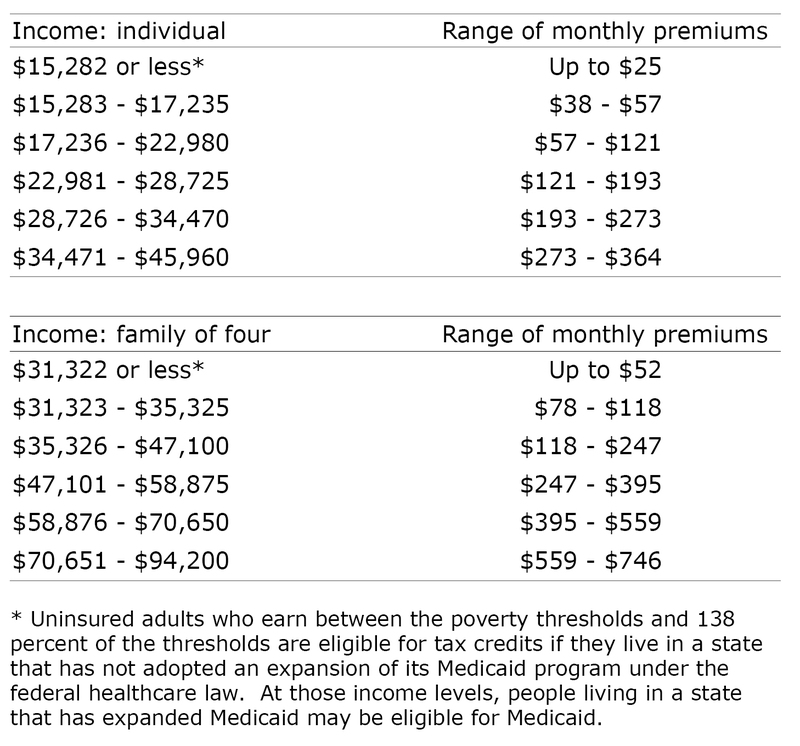 The premiums, which range from 4 percent to 6.3 percent of their income, start at about $57 a month for those at the low end of this income range and up to $121 at the high end. Everyone’s circumstance is different. Click here to enter your or your client’s specific information into the Kaiser Foundation’s calculator. Taxpayers can lower their premiums immediately by directing the government to pay the tax credit to the insurer, or they can wait and claim the credit when they file their 2014 tax return. Lower-income adults who purchase the “Silver” healthcare plan may also qualify for help paying their deductibles and copayments. You need to specify this chart and calculator is for those who are eligible to enroll via the new individual exchange (non-employer sponsored) market, only. Also important to know that if a person has coverage on an employer plan which is deemed “affordable” by the ACA, that person CANNOT qualify for an Advanced Premium Tax Credit (APCT) on the exchange. The individual market exchange is not intended to replace coverage for those with “affordable” coverage with their employer. You can still sign up for a plan on the individual exchange, but you just won’t get the tax credit. One irony of this is it will encourage some employers to drop group plans or reduce status to part-time (thus ineligible for group coverage) so their employees can then go to the Exchange and get the maximum subsidy. Rules are very different for the small group market, where any tax-credits accrue to the sponsoring employer. The new SHOP Exchanges for small group don’t start their open enrollment season until Jan. 1, 2014 and later in some states. Even moderately paid employees may still be better off in most cases remaining on their employer plan. This is due to the tax-favored treatment of employer paid premiums, i.e. deductible to the employer and non-taxable to the employee. Add in tax-favored treatment via Sec. 125 pre-tax plans for any employee contributions and it tilts the scales even more in favor of remaining on the employer plan. This is because the value of tax-free premiums may still exceed the value of the APTC (subsidy) you may get on the individual Exchange. Pretty simple and straightforward don’t you think? ?